Dang Nguyen has one of those origin stories that makes you want to try his food. He's a Vietnamese American who owns and operates two Lafayette restaurants: Saigon Noodles on Ambassador Caffery and Blu Basil on Johnston Street. His first experiences in cooking came from his parents. He was one of 5 children in his household and both his parents were at work for 16 hours most days, so he took what he learned and became responsible for preparing meals for the family. His favorite dish is a staple of Vietnamese cuisine that Americans have taken to in a major way: Pho. It’s pronounced “fuh,” and it’s a hearty yet delicate noodle soup made of beef broth and noodles. It also includes varying cuts of beef, as well as lime, bean sprouts, basil, chilis, and other accompaniments that are added as the dish is served, usually by the diners themselves, according to their taste. Dang says he loves it so much he could eat it for breakfast, lunch, and dinner. Like many aspects of Vietnamese culture, much of its food bears the mark of heavy French influence due to decades of French occupation. The broth for Dang’s Pho is akin to what Escoffier would call a white veal stock. He uses beef knuckle bones, but they are not roasted, and are instead blanched and rinsed before making the stock to further clarify the resulting broth. Another difference in the preparation from that of a French stock occurs near the end of the 24 hour process when highly aromatic cinnamon, clove, nutmeg, star anise, and other varying spices are added, giving his broth its signature character. 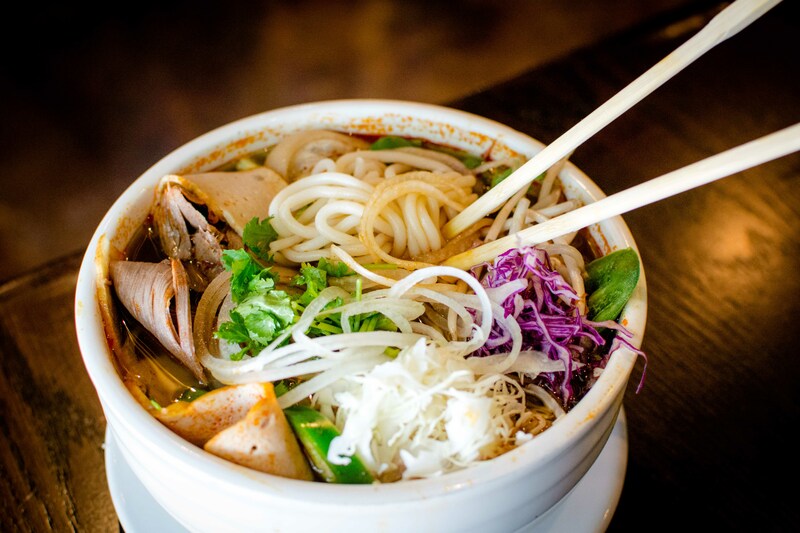 Dang began serving Pho, and other traditional Vietnamese favorites, to his customers when he opened Saigon Noodles six years ago. 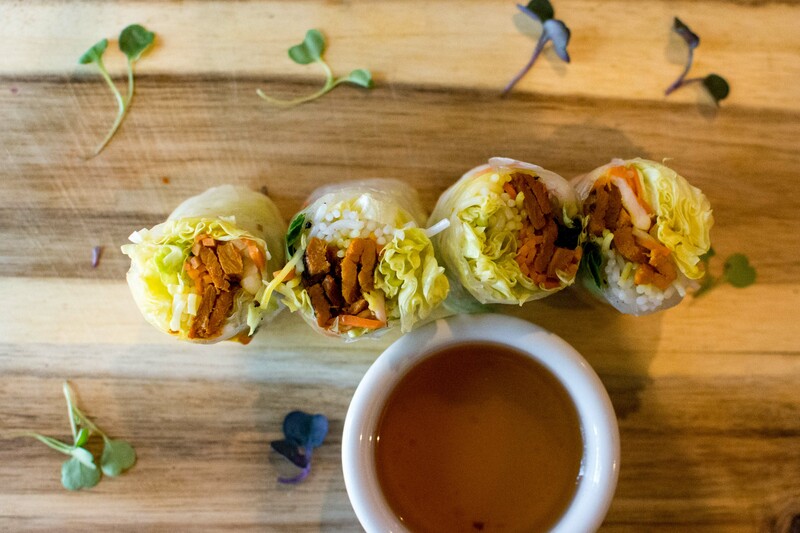 Several varieties of the soup grace the menu, along with Egg Rolls, Spring Rolls, and the best-selling Autumn Rolls: pork and fresh vegetables wrapped in rice paper and served with a pineapple dipping sauce. More adventurous diners can also try the Spicy Beef Noodles in a broth thickened with pork blood. 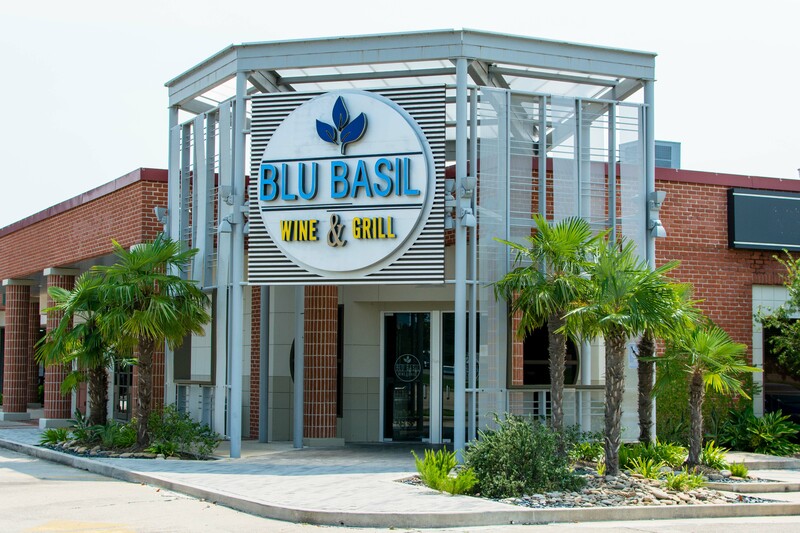 Dang’s second venture, Blu Basil Wine and Grill, located in the Time Plaza shopping center represents a somewhat of a departure from the traditional Vietnamese cuisine of Saigon Noodles. Saigon’s menu favorites are, of course, available, but the standouts are a blend of Vietnamese and Western cuisines. There’s the Dang Ribeye, marinated for 18 hours and served with a hearty baked Mac and Cheese using Panko bread crumbs instead of the classic Italian seasoned standard. 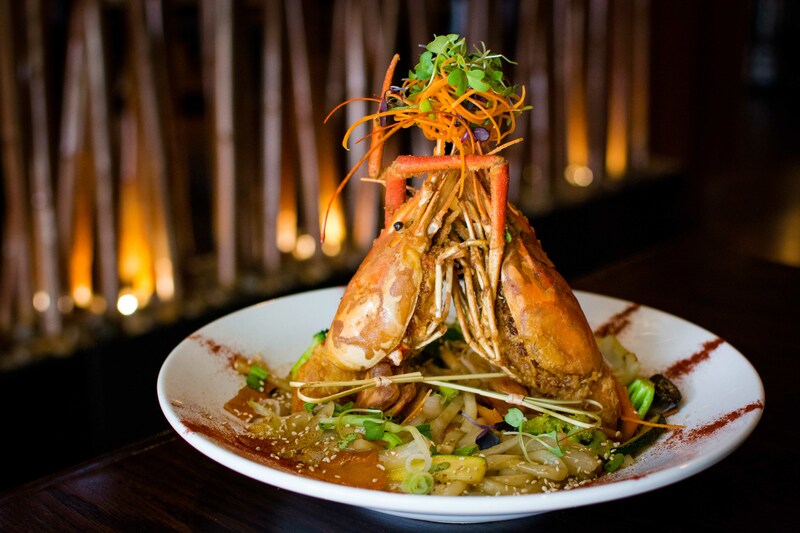 There is also the Giant Prawn dish served atop a vegetable stir fry with Japanese style Udon noodles. 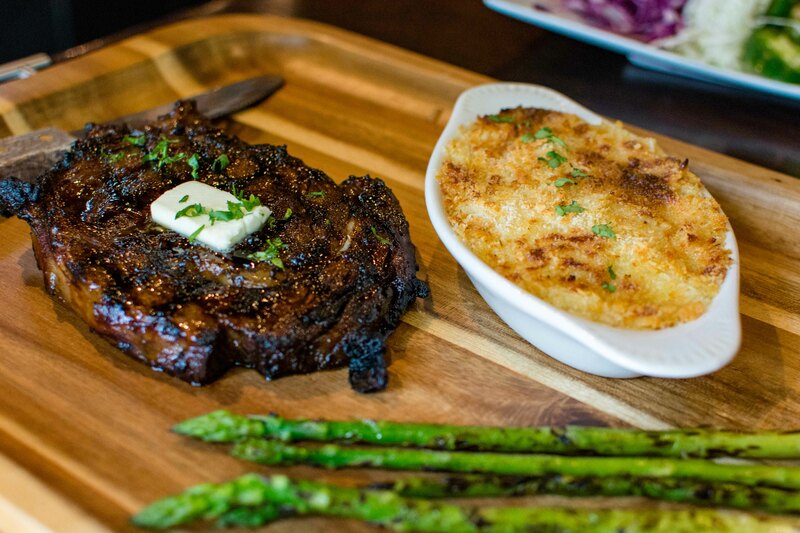 Blu Basil makes nearly everything, from making broth and sauces, to cutting their own steaks, in house from scratch. The Asian fusion character of Blu Basil is seen in the restaurant’s beverage selections as well. There’s a full bar with a martini menu featuring the Green Tea Martini, Thai Tea Martini, and the Good Morning Vietnam consisting of Sake, Lychee Vodka, and Elderflower Liqueur. The bar also features draft beer and an extensive wine list. Both locations feature another staple of Vietnamese restaurants that bears the mark of French influence: Vietnamese Iced Coffee. The delicious concoction uses Cafe du Monde chicory coffee and is steeped at the table into sweetened condensed milk before being mixed and poured over ice. Customers at Saigon Noodles can enjoy buy-one-get-one-free Egg Rolls by mentioning the Eat Lafayette special and checking in on Facebook. 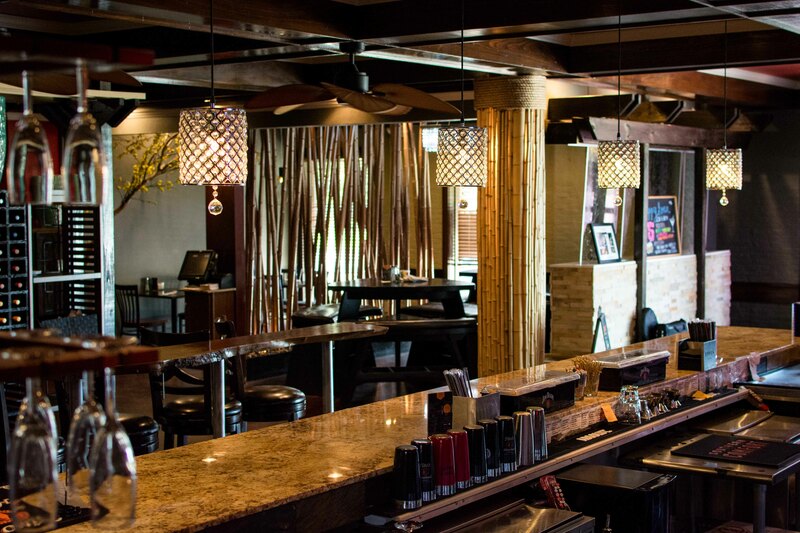 Similarly, diners at Blu Basil checking in on Facebook and mentioning the special can enjoy 10% off their entire check. Dang has two restaurants with plenty of options for anyone’s palate, and a meal at either is a welcome change of pace from everyday dining.